John 14:23: Jesus replied, "If anyone loves me, he will obey my teaching. 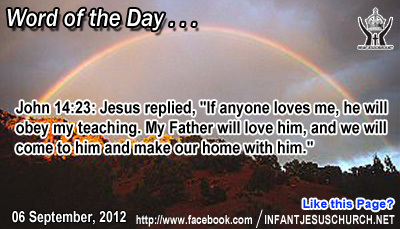 My Father will love him, and we will come to him and make our home with him." Heavenly Father, we know Jesus came on earth dwelt among us and obeyed your will. Give us discernment so that our obedience will not just be the obedience of your words, but a longing to live according to your will. We long to honor you since you have done so much to save us. Thank you Lord in Infant Jesus' name we pray. Amen. Today’s Gospel we see Jesus selecting the disciples and he chooses ordinary people, like us, as his ambassadors and he uses the ordinary situations of our daily lives and work circumstances to draw others into his kingdom. Jesus speaks the same point to us today: we will "catch people" for the kingdom of God if we allow the light of Jesus Christ to stand out through us. God wants others to observe the light of Christ in us in the way we live, speak, and witness the joy of the gospel. Paul the Apostles says, but thanks be to God, who in Christ Jesus always leads us in triumph and through us spreads the scent of the knowledge of him everywhere. For we are the fragrance of Christ to God among those who are being saved and among those who are perishing. Do we witness to those around you the joy of the gospel and do we pray for your neighbors, co-workers, and relatives that they we may come to know the Lord Jesus Christ and grow in the knowledge of his love?